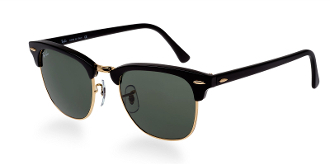 Ray Ban Clubmaster 3016. Gold wire lower rim with classic black acetate upper rim and black temples with crystal green colored lenses. Available in our Optical Shop.